Here’s a useful, cost-efficient product if you have a rifle with a 3/8″ dovetail on top of the action and you want to use a scope with Weaver-style rings. 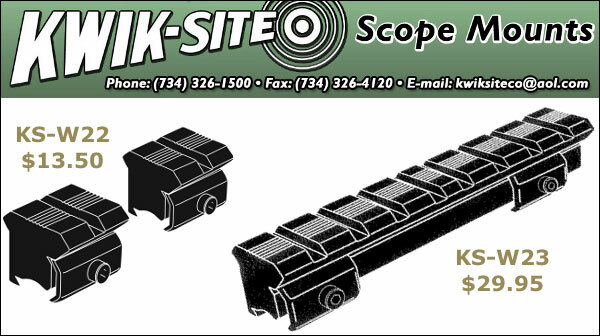 Kwik-Site offers three grooved receiver adapter products. The first is a two-piece set of short rails that clamp to a 3/8″-wide dovetail. Priced at just $13.50, this two-piece rail set, item KS-W22, is available in gloss black, matte black, and a stainless finish. If you prefer a one-piece rail, Kwik-Site offers the KS-W23 ($29.95) and KS-W24 ($30.95). Both are offered in matte black or silver (stainless-look) finishes. The KS-W24 will work with Romanian rifles. These Kwik-Site products provide a low-cost solution if you want to take a scope from a rifle with a Weaver Rail and place the optic on a dove-tailed action without removing the scope from the ring set. Please note however, you’ll still need to re-zero the scope when you move it from one rifle to another. To order online, visit www.KwikSitecorp.com. Share the post "Weaver Rail Adapters for Top-Grooved Receivers"
If you can’t get by with tip-off rings (there are so many different styles, quality levels, and price ranges out there), unless the gun is ultra-collectible, just have the thing drilled and tapped for std weaver bases, then use whatever rings you want. There are also better and cheaper methods to convert 3/8″ to Weaver.